Before the Manchus conquered south of the Great Wall in 1644, the Manchus had grown in strength by learning agriculture and ironworking as well as bureaucratic administration from the Ming Dynasty. 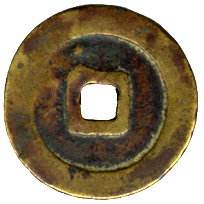 Nurhachi (or Nuerhachi, a tribal leader) had declared himself emperor and used his imperial title "T'ien Ming" to cast copper cash in Chinese style. He cast the T'ien Ming T'ung Pao with Chinese inscription and the T'ien Ming Han Ch'ien with Manchus inscription in 1616. The appearance of this cash is relatively rough and its obverse was inscribed with 4 ugly characters in calligraphy. I hardly persuaded myself that this is a genuine cash, though I was told that this coin is authentic by some advanced collectors. I purchased this cash in a big coin show a few years ago. 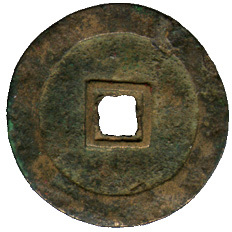 The third Chinese character "T'ung" appeared with only one dot, while some of the specimen appeared with 2 dots. This cash was cast with brass and copies cast with copper or bronze also existed. All the T'ien Ming cash appeared with plain reverse as I know. 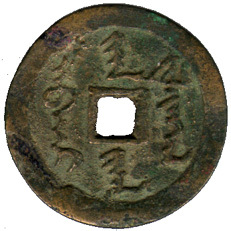 This coin image is a T'ien Ming Han Ch'ien inscribed with the old Manchu scripts minted by Nurhachi in 1616. The diameter of this cash is large than the T'ien Ming T'ung Pao cash. Its weight is heavier than the above cash too. 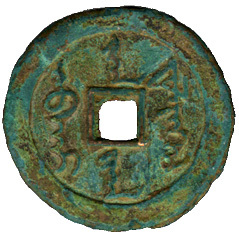 It is logical to assume that the Manchus legend cash was designed for circulating in the north of the Great Wall, while the Chinese legend cash was designed for a parallel circulation with the Ming Dynasty cash (Wan Li T';ung Pao) in the south of Shanhaikwan. There is a funny Chinese legend about the cash coins, the Qing soldiers attach a talismanic virtue to the Tien Ming Han Ch'ien cash. If genuine and placed inside the military cap, bullets and bayonet could not wound the wearer in battle. 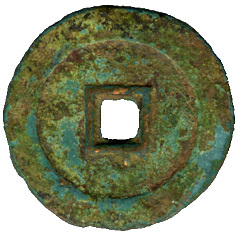 This is another T'ien Ming Han Ch'ien cash. The whole cash was cover with oxide and dirt. The Manchu scripts are not the same as the above one, especially the first character "Apukai". The last stroke appeared with a narrow fork. 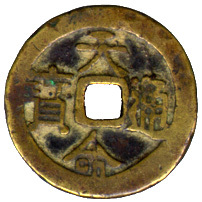 The 4 Manchu characters is read as Apukai (means heaven), Fulinga (means mandate), Han (leader), Chiha (means money) in the Manchu consequence as left, right, top, bottom.